This template copyright notice has been designed to help website operators protect their copyright. Websites as such are not copyright-protected works. However, most websites will incorporate text (literary works), images (graphic works), computer code (also literary works) and potentially other types of copyright-protected work too. 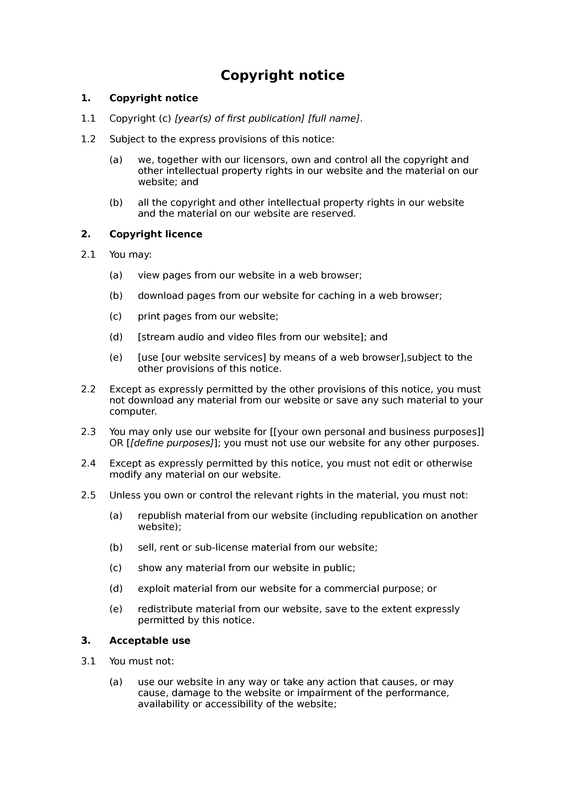 The notice has several different purposes: (i) it contains an assertion of the ownership of copyright in the website; (ii) it sets out licensing terms which describe the ways in which the website may be used; and (iii) it contains provisions relating to copyright infringements, enforcement and permissions. If you are using one of our website T&Cs of use documents, you are unlikely to need this template, as most of those documents incorporate a copyright notice. Copyright licence: licence to use website; no downloading; website use: permitted purposes; no modification of website content; limitations on licence to use website (no redistributable content). Acceptable use: acceptable use: prohibitions (simple). Enforcement of copyright: copyright protection taken seriously; consequences of copyright infringement. Permissions: how to request permission to use copyright materials.